My name is Marissa Preston. I’ve lost 76 pounds in 9 months by eating all natural, healthy food, using My Fitness Pal and working out. 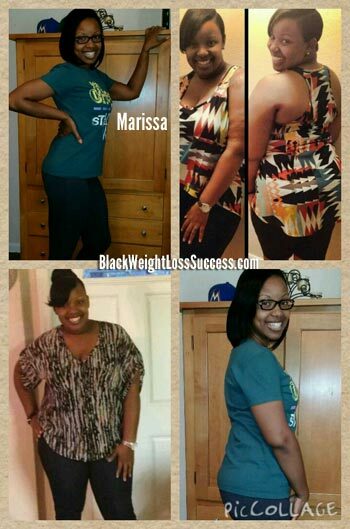 I have reached my weight loss goal, but I continue to eat healthy and workout as a lifestyle! My motivations are my husband and two sons who are 2 and 7 years old. What also motivated me was the fact that I was 214 lbs and I didn’t even weigh that much when I was pregnant. I started my weight loss journey in November 2013 at 214 lbs and I am currently 136 lbs (height: 5’3″). I use an app on my phone called My Fitness Pal where I count my calories and track my exercise. My Fitness Pal calculates my calorie intake based on my height, age, weight, and personal profile. I watch my carbs, cutting out white breads, white rice, pasta and potatoes. I also don’t drink any sodas. I’m watching my sugar intake, which means cutting out candy, cookies, etc. Drinking 10-12 cups of water a day has helped as well. Most importantly, I eat 4-6 small meals a day. Exercise wise, I workout about 4 times a week and when I first began my weight loss journey I did a lot of cardio to get the weight off. Now, I’m trying to transition into doing more weight lifting and toning. The advice that I give my to any one who is trying to lose weight is to find foods that are healthy but also taste good and are enjoyable. You can still go out to dinner because a lot of restaurants now have lighter menu choices. Also, get a workout partner, who could be your husband, friend, co worker or child. You can also join a fitness group. Having a partner will make your workout easier. Don’t get discourage if every week when you weigh in you don’t lose weight, because there may be weeks when you don’t lose any weight. I also suggest that you give My Fitness Pal a try. It’s very user friendly and you can add friends on the app so that you will be able to see your friend’s food diary, which can help you with your food choices. Congrats! U look great. Thanks for sharing. I use myfitnesspal as well. It reveals a lot about the food we eat. Congrats!! You look amazing. I just downloaded the app to my phone and I’m surprised at the amount of calories I take in everyday.